I’ve never been to Spa Francorchamps for a sports car race, so I thought I’d dig out one of my favourite books, Time and Two Seats, by Janos L Wimpffen and take a look at a random race report from there before I head up for the WEC six hour race on May 6/7. I say book, in fact it’s a two-volume tome, covering five decades of long distance racing that span the fifties through to the nineties, but there are gems on every one of its 2000 pages. The race itself was relatively uneventful. Unlike the two previous races in the 1953 championship, nobody was killed, it’s strange to think just how dangerous motor racing was in those days. 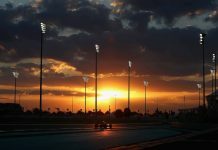 Reliability wasn’t the same as it is now either, only 12 cars were running and classified at the finish, with more than half the field of 40 cars dropping out. This was not long after the Second World War, and there were not many racing cars around. Looking down the entry list it’s interesting to see a Jowett Javelin entered by a married couple. And at the other end of the professional scale, with Farina, Fangio and Ascari driving in the Ferraris and Alfa Romeos, the race featured every F1 driver that had ever become World Champion, plus Mike Hawthorn, who would go on to win the F1 title in 1958. In fact many of the cars racing were touring cars, many of which were entered by local French and Belgian owners, and these were quickly lapped by the rapid Ferraris.At the end of the race, during which 260 laps were covered, Farina and Hawthorn’s Ferrari was 18 laps ahead of the second-place Jaguar C-type, which was itself unusual in that it was shared by three drivers. The third of these is listed as Birabongse Bhanubandh, better known to racing fans of the last century as Prince Bira or B. Bira. I’ve often seen his old ERA (forerunner of the BRM) at historic meetings, resplendent in blue, with yellow wheels, the national racing colours of Thailand (or Siam as it was when Bira was racing). I think I’ve only ever seen one other car painted in those colours, and that was back in 1997/8, a Formula Renault Tatuus, run by Manor for Tor Graves. Tor is back with us at Manor now, sharing car number 44 with Will Stevens and James Jakes. Also in the entry list was a Studebaker Hawk, although it never actually showed up for the event. I’m always fascinated by Studebakers, as my father had one in the early sixties. I think ours was a Champion, and as it was just a little too long to fit in our garage, father had to modify the garage doors to get it in. With the focus in today’s LMP1 category being on the Hybrid cars, it also seems relevant to mention that Studebaker manufactured electric cars from 1902 until 1912, before concluding that “ultimately the superiority of the gasoline car [is] apparent”. Finally, if you’re attending the race, don’t forget to download the WEC and Manor apps before you go, and if you fancy meeting up in the paddock while you’re there, let us know! Get the Manor iPhone/iPad app here, get the Android app here and remember, the Manor team are open to everyone to become a part of the team, if you have a question or just want to say hi, email them on team@manorwec.com or if you prefer, get them on Twitter @ManorWEC and find out more via their website. Are the 'new points' working?